lesson plans, teaching resources, and fun projects for students. 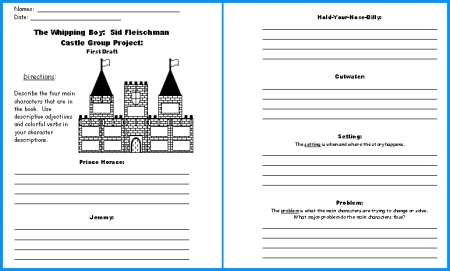 On this page, you will find teaching resources for fun individual and/or group projects to use with Sid Fleischman's book. 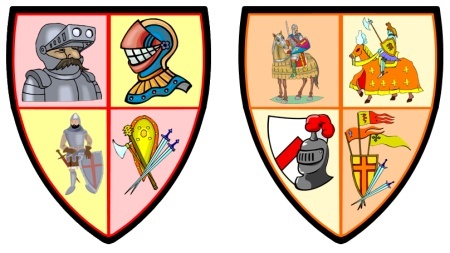 In addition, this page contains teaching resources with castle, knight, and Middle Ages themes. If you are doing a Newbery Medal study in your classroom, this is a great book choice to use as a whole class novel, or as a historical fiction novel study. The Whipping Boy won the Newbery Medal in 1987. When I read this novel with my students, I combine it with a medieval times unit and my students also complete writing assignments related to castles and knights. 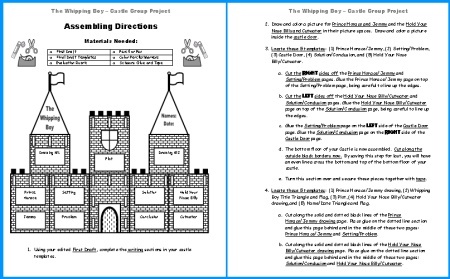 Many of The Whipping Boy lesson plans on this page can be used for any Middle Ages theme. 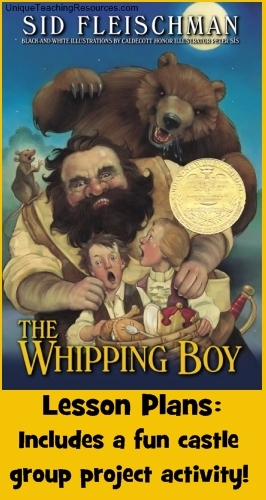 Below you will find some of The Whipping Boy lesson plans that I have developed over the years as I have used this novel with my students during our Newbery Medal book study. 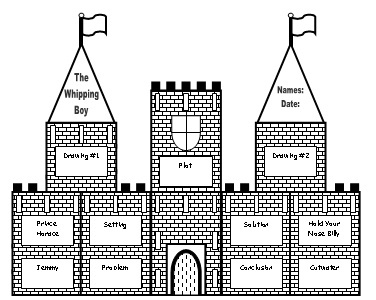 All of The Whipping Boy lesson plans on this page include a second version of each resource that contains UK spelling and punctuation rules. 4 teaching resource sets that are found on this page. banner, and the other worksheets that are included in the resource set. 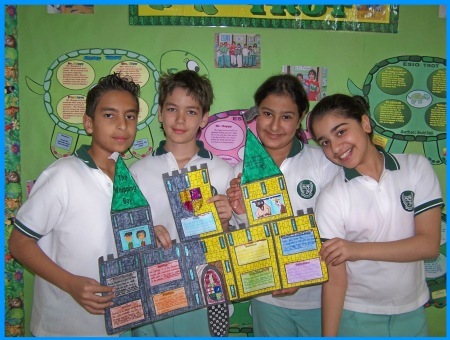 For this fun assigment, students describe the 4 main characters: Prince Horace, Jemmy, Cut Water, Hold Your Nose Billy. Students also write about the the setting, problem, solution, and conclusion of the story. 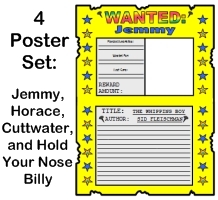 This resources set includes 4 Wanted Posters for these characters: Prince Brat, Jemmy, Cutwater, and Hold-Your-Nose Billy. For each poster, students write about: the character's appearance, what he was wanted for, where he was last seen, and the crime..
and larger picture examples for the 2 projects shown above. 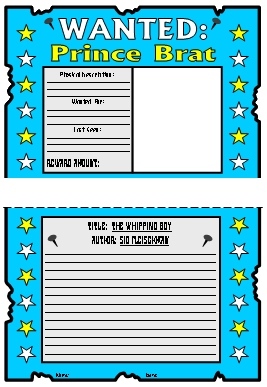 This five page banner is included for free in this set of The Whipping Boy teaching resources. You will be emailed a download link for this castle project so you can download and use it today! One of my students' favorite activities during the school year is completing this castle group project. My students love completing this castle project with the members of their group! Above: Students working on their project together. Above: Students displaying their finished projects. 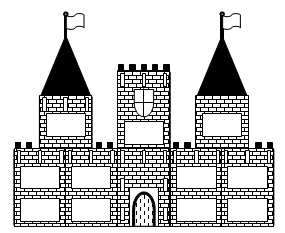 This teaching resources set includes step by step directions on how to assemble the 11 templates into a large castle that looks like the one shown below. 25 inches in length and 18 inches in height. Depending on the age of your students, you could assemble these projects ahead of time for your students. Each castle takes me approximately 10 minutes to assemble. I have given my fifth grade students the direction sheets, and they were able to assemble their projects themselves. I cut out the two templates that have flags on them ahead of time for my students because they have narrow lines to cut along. 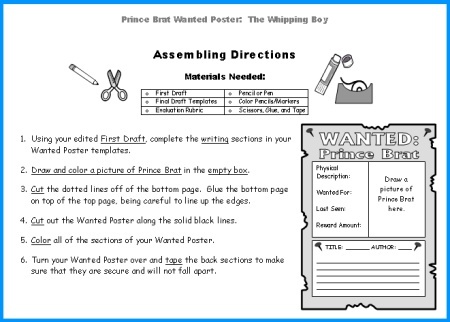 There are 3 pages of directions that describe how to assemble this project, the first 2 worksheets are shown below. 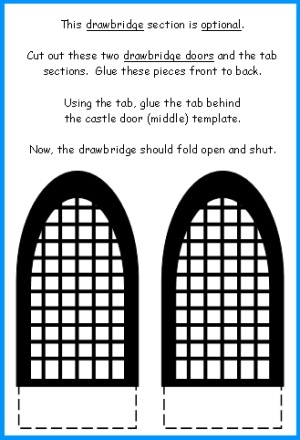 There are also assembling directions and tips written on the actual castle templates. 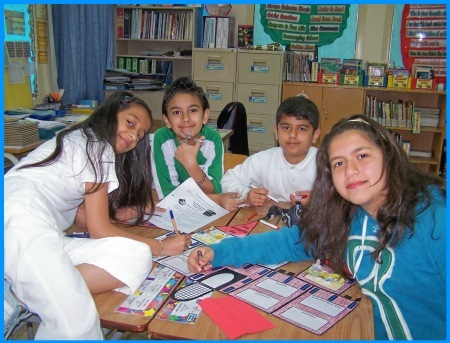 This is a cooperative group project and students begin their projects by completing their first drafts together. Students proofread and edit their first drafts together before they begin their final drafts. 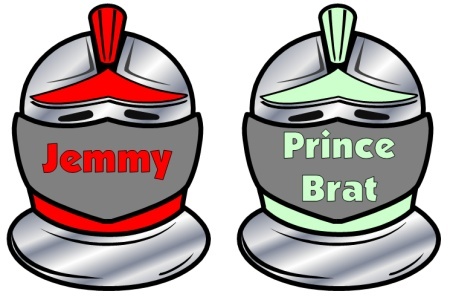 Using their first draft worksheets, students describe these four characters: Prince Horace (Prince Brat), Jemmy, Cutwater, and Hold Your Nose Billy. Next, students write about these 5 parts of the story: setting, plot, problem, solution, and conclusion. There are 3 first draft worksheets that are included in this set. The first 2 worksheets are shown below. 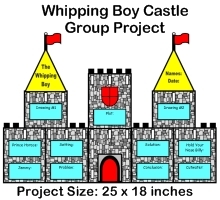 This unique and fun group project for The Whipping Boy includes 11 templates that assemble into a large castle. The finished castle projects measure 25 inches in width and 18 inches in height. Your students will love working on this large group project together and their finished projects will make an eye catching classroom or hallway display. Below are examples of the 11 castle templates. to draw pictures of the 4 main characters. that includes adding a drawbridge that folds open and closes. When I am first introducing my students to a new group project, I believe that it is important for them to have a visual example of what the completed project will look like. I always complete an example of this castle project before I introduce this activity to my students. Before my students begin writing their first drafts, I show them my finished castle project. This visual example immediately grabs my students' attention and they are excited to start working on this project together from the very beginning. I have found that my students are engaged and use their best effort as they go through the steps of the writing process and complete this fun project with their group members. 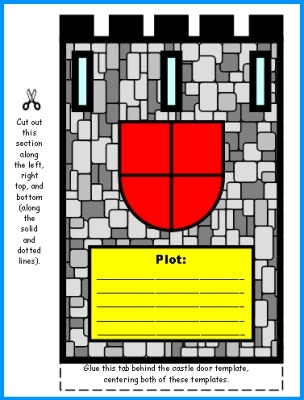 To save you time in coloring your example that you show to your students, I have included color castle templates in this teaching resources set. 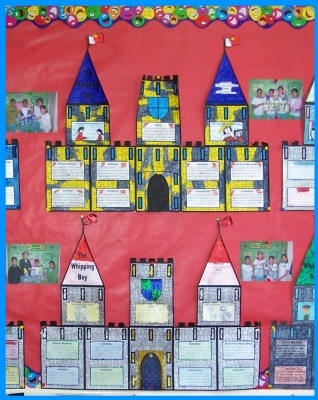 I display my finished castle project at the front of my classroom so that students can refer to it as they are completing their projects together. Below are examples of the color templates. 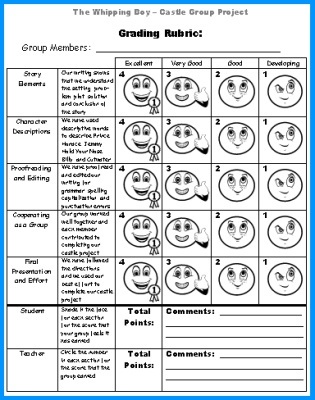 After each group has completed their project, they can evaluate it using the group project grading rubric that is provided in this set. After the group has graded their project, there is also an area on the rubric for the teacher to evaluate the castle project. I know that it takes teachers a lot of time to design and assemble their classroom bulletin board displays. Many teachers spend their valuable time cutting out large display letters or making a banner at home on their own computers. In order to help save you time in assembling a bulletin board display featuring your students' group projects, I have designed a 5 page banner that is included for free in this set of teaching resources. EXTRA FREE TEACHING RESOURCES #1: For many of the projects that are available on Unique Teaching Resources, I try to design some extra bulletin board accent pieces that will help you to decorate your classroom bulletin board display that features your students' work. 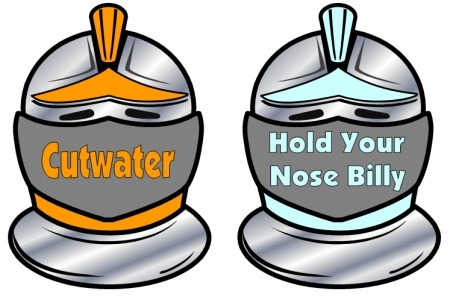 This set of The Whipping Boy lesson plans includes 5 bulletin board accent pieces that are shaped like knight helmets. I have written the title of the book and the main characters' names on these 5 accent pieces. 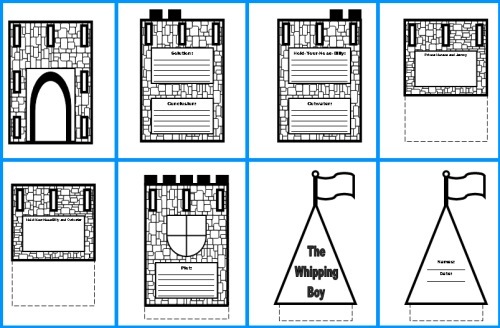 EXTRA FREE TEACHING RESOURCES #2: This set of The Whipping Boy lesson plans also includes 4 bulletin board accent pieces that are shaped like shields that contain graphics related to the Middle Ages on them. after they have read The Whipping Boy by Sid Fleischman. 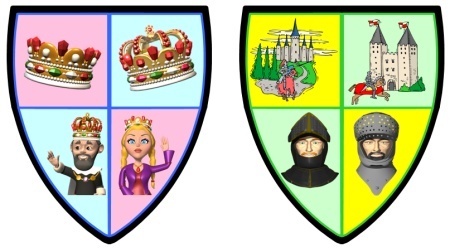 Above: Examples of two finished castle projects. Prince Brat, Jemmy, Cutwater, and Hold-Your-Nose Billy. Students love creating wanted posters for characters from the books that they have read. The Whipping Boy is an ideal book for wanted characters because of the four main characters in this book. 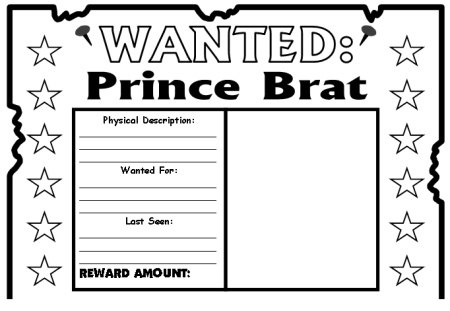 This set includes separate wanted posters for Prince Brat, Jemmy, Cutwater, and Hold-Your-Nose Billy. All of these characters have done something wrong during the plot of the story, so students can write about an actual event from the book for these reading response projects. They can also use their imaginations and create a new crime that these characters committed. For students who are often reluctant about writing, I have found that my students think that this writing task is criminally fun and they tackle this assignment with great enthusiasm and creativity! You can let each student select which one of the 4 characters from the story that they want to write about. 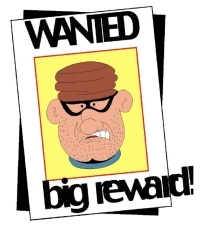 These wanted posters are also ideal for collaborative group student projects. 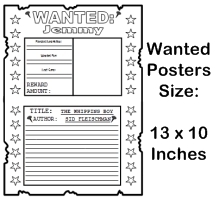 This set of teaching resources contains two templates that assemble into a Wanted Poster. The completed wanted posters measure 13 inches in height and 10 inches in width. There is a second version of each resource that contains UK spelling and punctuation rules. 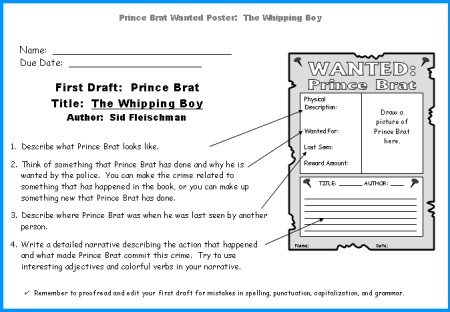 worksheet for the Prince Brat Wanted Poster. Each character's set includes two first draft worksheets. Students should complete their first drafts and then proofread and edit them before they begin their final draft templates. 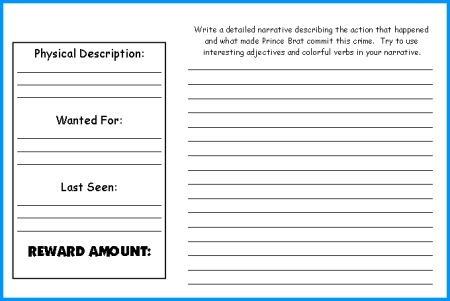 Below is an example of the first draft worksheets for the Prince Brat set. Below is an example of the final draft Wanted Poster templates. Assembling these Wanted Posters is easy! Students cut the dotted line off the bottom section, glue this piece onto the top section, and then trim along the thick black border of the Wanted Poster. Students draw a picture of their character inside the empty box. Below are 4 examples of the final draft Wanted Poster color templates. Each one has a different color scheme. As you are introducing this creative writing assignment to your students, it is helpful to have a visual example of a finished Wanted Poster for your students to see. 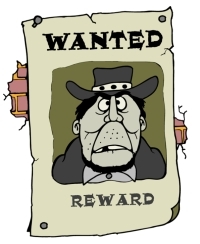 I have provided color templates of the 4 different Wanted Posters to save you time in having to color your example. 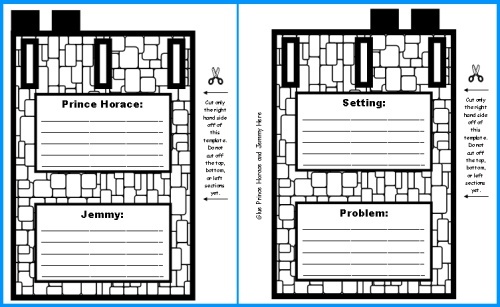 You can also choose to print out these color templates to give to your students, instead of having them color their templates themselves using the black and white templates. 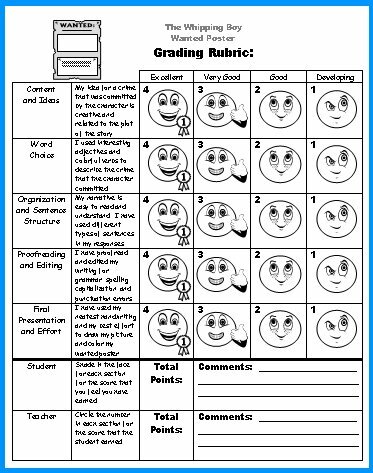 Below is an example of the grading rubric that you will find in this set. also includes a 5 page bulletin board banner. 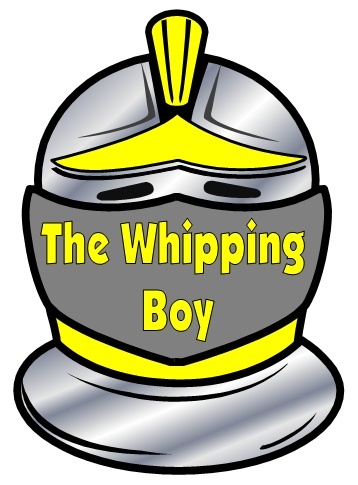 Thank you for visiting my The Whipping Boy lesson plans page.